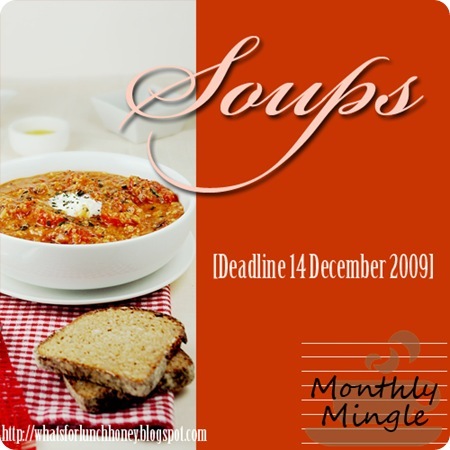 This recipe has been submitted to Monthly Mingle for Dec 2009 being organized by What’s for Lunch Honey? and Tongueticklers. I recently read The Kitchen Confidential by Anthony Bourdain. The chef is describing the turning point of his life. He was less than 10 years old and had gone to France to visit relatives. That was when he tasted French cooking for the first time. Soup was served and it was cold. He was so taken by surprise that a cold soup and a yummy one at that could exist that it left an indelible mark on him. Funnily, it has also made a huge impact on me and the incident, though experienced only second hand, will always stay with me. This recipe of chilled corn and coconut soup is in memory of that moment when I felt the shock cold soup brought to a top chef when he was a little boy. The recipe is simple in itself and very wholesome. 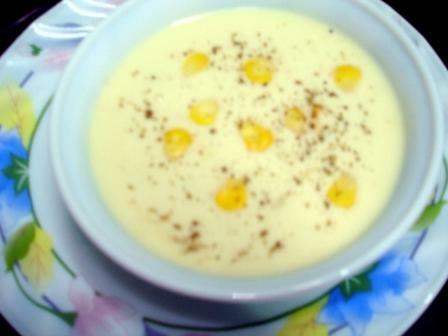 A beautiful blend of corn and coconut milk, the flavor is enhanced by jalapeno chile and the simple art of reduction. Deseed jalapeno chile and chop it into little pieces. Pour water in a pot. Add chopped chile, corn and coconut milk. Bring to a boil and then let it simmer for 30 mins. Let it cool. Pass the soup through a blender. Sieve and discard solids. Season with salt and pepper. Chill overnight or for 4-5 hours. Add lemon juice only just so much. Serve cold. Garnish – Black pepper and corn kernels.